Over the past nine years, San Francisco's property-tax-paying residents have spent $94 million to put 18,000 children through a year of preschool - a huge investment made without knowing what the payoff would be. "People need to know whether it worked or not," said Wei-min Wang, program coordinator for First 5 San Francisco, which coordinates the taxpayer-funded preschool program. "It was the right time to ask the question." 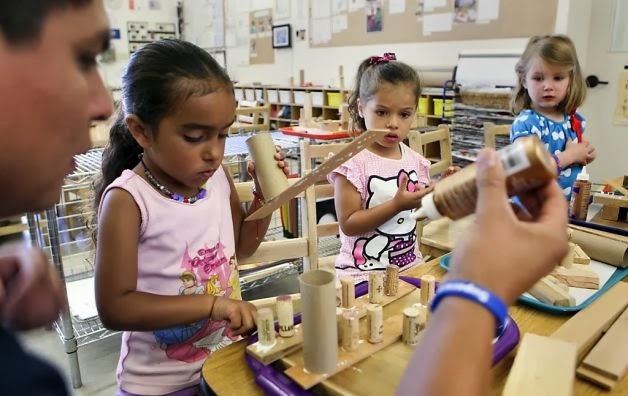 Children who participate in the city's Preschool for All programs have a huge advantage when they get to kindergarten, according to a scientific study released to The Chronicle. The report showed the preschoolers had a three- to four-month advantage over kindergarten classmates who didn't participate in the program. In simpler terms, it means the Preschool for All students were way ahead in identifying letters and words, counting numbers and doing simple adding and subtracting. They were also better at listening, following directions, focusing for longer periods of time and controlling impulses. The preschools are primarily funded by Proposition H, a 2004 voter-approved measure that established the universal preschool program, as well as art, music, physical education and other enrichment activities. The 10-year tax measure expires after next year, and city officials are expected to ask voters to renew it. This year, an estimated 3,400 4-year-olds will get a free half-day of preschool at one of the 137 sites across the city through the program - about 65 percent of those eligible, said Laurel Kloomok, executive director of First 5 San Francisco. All told, 83 percent of San Francisco children attend preschool, compared with 74 percent nationally. Significant gains were seen in preschool participation rates among African American and Latino children, with 80 percent now in preschool programs, compared with 68 percent and 54 percent, respectively, before 2004. "It's free for everybody," Kloomok said. And not just free, but high quality, she added. School district and federal Head Start preschool programs that existed prior to 2004 had to go through a rigorous evaluation to qualify for the Preschool for All approval and associated funding. Program officials hope to add nonprofit and private preschools to the list, with each meeting qualifications including a minimum enrollment of 25 percent low-income students. While there was pressure to push quantity over quality, organizers pushed back. "We kept our eye on what we wanted, Kloomok said. "We kept up that standard." To the untrained eye, most preschools might look the same - children playing, painting, singing. But there's a difference, said Kathlene Dominguez, a veteran kindergarten and preschool teacher. In Preschool for All programs, play is structured to learn skills. Teachers know how to communicate with students to get them to think critically. Activities and lesson plans help students learn social skills and how to follow directions. In addition, there are health and vision screenings as well as mental health consultations and support for children who might need special education services. As soon as Preschool for All children hit Dominguez's kindergarten classroom, she could tell. "I did see a very huge difference when Proposition H went into effect in terms of what the kids were bringing in," she said. "They were ready and they knew what school was about." The students knew how to get along with classmates who looked or acted differently; they knew how to share; they could sit for 45 minutes to do academic work, she said. They knew the little things that matter, like how to ask a classmate to play or even what a friend was. With academic expectations now higher than in years past, a kindergarten teacher can't focus on finger-painting and doesn't have as much time to teach students how to be kind or how to be a good friend, Dominguez added. "You're getting a lot of children learning the basic social foundations we take for granted in the school environment," she said. "It's very easy to identify the Preschool for All kids." For the full report, go to www.first5sf.org and to learn more about the Preschool for All program or information on enrolling, call (415) 354-3873.